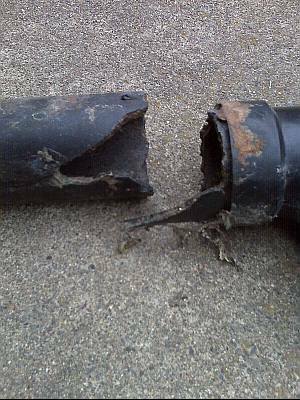 Drainage Pipe Leak – This One Is Not Uncommon! 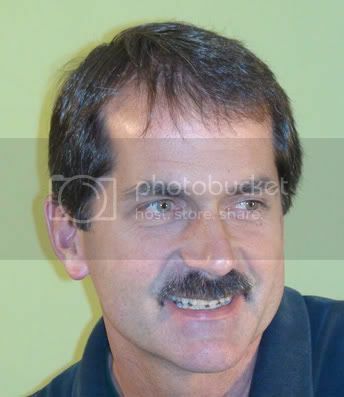 So you move into your home or apartment and start to get the pictures and things hung up on the walls, sometimes with nails, sometimes with screws. The key to getting things to look “just right” often times means centering on the wall, or above the television, or toilet. That’s right, I said toilet. This post deals with this location specifically. It is common for an upstairs toilet to share the same drain line as the downstairs. Two bathrooms, one above the other, very common in apartment because they have the same floorplan. This drain line is centered on the toilet. I recently came across an apartment unit that was moist on the wall above the toilet. 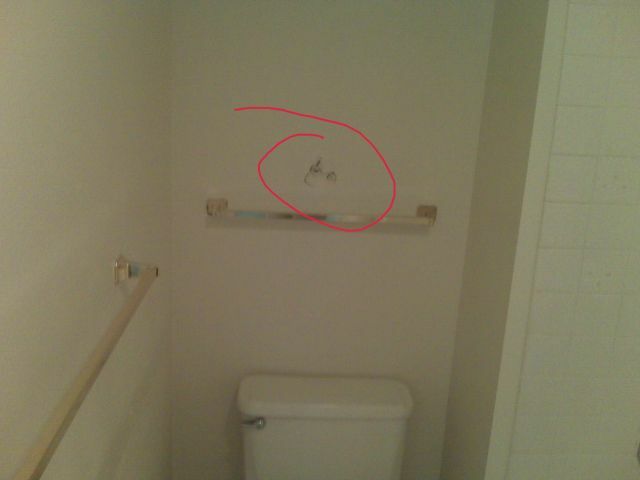 The previous tenant had hung something centered above the toilet with a screw that drove through the plastic drain pipe. What are the odds of this happening? 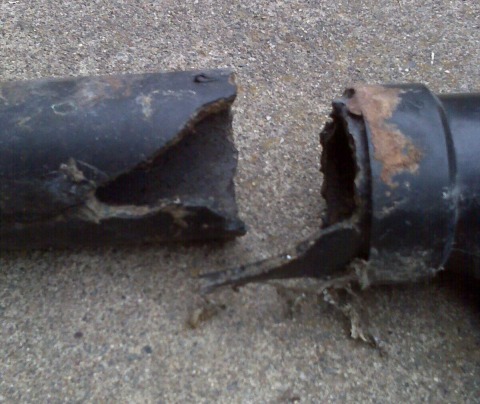 Well this pipe had 4 holes in it at different spots, I’d say the odds are higher than I originally thought. Usually the pipes are set back far enough to eliminate this problem with the drain pipe, but that’s not always possible. The real “kicker” is that the problem does not start until the screw of nail is removed. In most homes and apartments, that means when the tenant or homeowner moves out. The good news is that this can be fixed. This is a video showing what is necessary in doing some of the water damage work that we do. Most people do not realize what all needs to be done in repair water damaged areas. The video breaks down the different stages of the process so that you can get a better idea what is involved. The water heater had been leaking undetected for quite some time. The damage was worse then the insurance adjuster thought it to be. Tromler Construction contacted the insurance claim adjuster for the owner, and an additional check was sent to the owner. There was no out-of-pocket expenses to the owner for this project. We were able to do the work for less than the insurance claim. The different in price allowed the owner to pay for the water heater and deductible from money the owner saved by using us. We like that because the customer is satisfied with the results. They are likely to refer us to someone else in a similar situation. 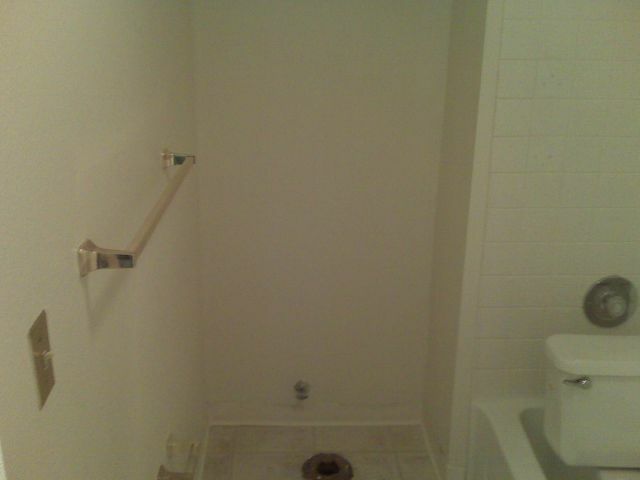 Here are some pictures of a bathroom rehab done in an apartment home here in Cameron Park, CA. The drain leak was found and the repairs made, before air drying the wall damage. This unit in a Cameron Park community was completed in three working days. Finding an experienced general contractor can make bathroom repairs and remodel projects go smoothly. Let us know if we can help you found a qualified contractor in your area. These pictures were taken after the plumbing repairs were completed. The wall behind the vanity cabinet was opened to remove the moisture condition in the damaged drywall, and to allow plumbing repairs to the leaking pipe inside the wall. Tromler Construction is a General Contractor specializing in property restoration and repair. Tromler Construction is based in the Placerville area. Projects can be found in Placerville, Cameron Park, Shingle Springs, Rescue, Diamond Springs, El Dorado Hills, Folsom, as well as the Sacramento area. Many projects have extended into the San Francisco Bay area as well. Contact us at anytime with any questions. The restoration and rebuilding from water damage and dry rot can be a large project that an experienced contractor can help make less of a burden on you, the homeowner. If you are a home owner, you probably have experienced water damage. The drain leaks, you catch it early and clean it up. 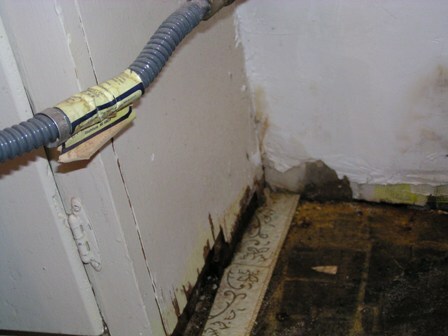 Sometimes the damage and rot from water is not as obvious or the water damage that is hidden until it is more severe. 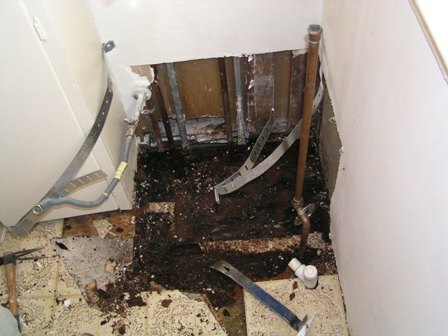 Water damage and Dry rot can come from many sources, we will focus on a plumbing leak. 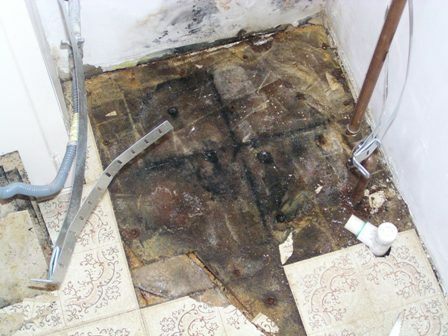 For example, water related damage from a water heater. The water heater has been leaking and caused dry rot under the home. The home owner was not aware of the extent of the rot damage. The owner of the home had a water heater that was leaking within the appliance. The water ran down the inside, and into the pan below. The metal pan had small holes due to electrolysis. The small holes allowed the water to seep out and under the pan. The pan never filled with water because of the holes, so the owners never notice the start of the water damage to the floor and walls. Once it became apparent that the water was leaking water damage and dry rot was severe. 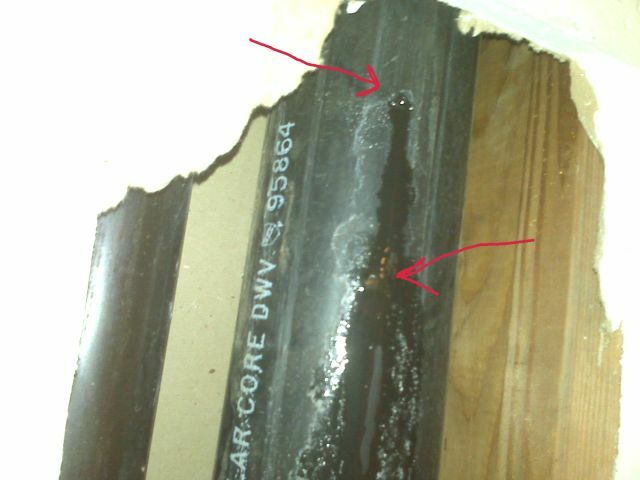 Here are some picture of the damage caused by the leaking appliance. The water heater was replaced to stop the leaking. An insurance claim was made after this discovery and an experienced contractor, Tromler Construction, was asked to make recommendations. The project will start soon after the insurance issues are done. Tromler Construction will post the water damage findings in a later post. Water Damage Insurance – Get, File, and Claim. As with most insurances, it is necessary to file water damage insurances, since this can help you save a great deal of money in the event that water damage wrecks your home. Generally, water damage is part of the homeowners insurance. In fact, it is one of the reasons why people make home insurance claims. However, not all types of water damages can be covered by your home insurance. Hence, it is essential to know the things that are covered by your water damage insurance before making any claims. * The damage caused by water is covered. For example, a leaking dishwasher hose causes your carpet to become soaked in water. The carpet is covered by the water damage insurance, but you have to repair the leaking hose yourself. * Anything that is considered to be accidental, like a burst pipe, is covered by your water damage insurance. * Bathtub overflows are considered accidental, hence it is covered by the insurance. * Water damage due to floods is not covered, that is why you need to get separate flood insurance for this. * Water damage due to neglect and poor maintenance is also not part of the water damage insurance, since the water damage is caused by your own carelessness. * Sewage backups are generally not covered by water damage insurances. * Water seepage is not covered, since this is considered to be a maintenance problem and is not accidental. Filing water damage insurance claims should be done as soon as you have experienced water damages. You must notify your insurance company about the damages that you are going to claim. Your agent will then instruct you on the step-by-step procedure that you need to follow to claim your water damage insurance policy. During this stage, it is advisable to keep all contact numbers of your insurance company close to you, and take note of all communication that transpires between the two of you. The next step in filing your insurance claim is to assess and document the extent of water damage to your property. You can make use of a camera to take pictures of your properties, or better yet, a video camera. Make sure there is written documentation accompanying these, and always keep those handy. It would also help to repair the properties that you think you can fix. Remember that poor maintenance or neglect is not covered by your insurance policy, so you might as well do everything you can to restore the items. Preventing future damage is part of your responsibility, as well as keeping all the receipts you used for these repairs for reimbursement. You must also create a list of missing and damaged items for replacement. If you have replacement cost coverage on personal properties, you can just buy new ones. This job will be much easier if you have kept an updated inventory of all your properties before the water damage occurred. Finally, you just have to wait for your insurance claim. Keep in touch with your insurance company so that you are updated with the latest news on your water damage insurance claim. If you have objections on your insurance company, you can also file a complaint in your state insurance commissioner. Filing a homeowners or water damage insurance can be tedious, but it can help you a great deal in getting your pre-water-damaged life back.